Hanging lightly in the air, rippling in the wind, catching the sun in the fine threads. The spider sits in the middle of her web – round black body and limbs outstretched. The web extends around her, encircling her and marking the space she owns. The centre is the massive body surrounded by delicate orbiting threads. Sun sits in the middle of our planetary system as other bodies fall into gravitational orbits. Planets have their own satellites, which in turn, may have satellites of their own. The system is constantly eating eatself. Everything is falling towards the centre in an infinite spiral. As the first prey sticks to the invisible threads that enormous body in the centre of the web lunges at its victim. We now see two objects interacting via the threads that form this carnivorous network. She slowly wraps the prey into a silk cocoon – using her threads to mark her property. When he is completely encased, she takes him towards the centre where the two bodies will join during the feeding. The earth is constantly falling towards the sun and will one day be consumed in its fiery expansion into its own solar web. But there is not always an object at the centre. Let’s not forget that our milky splashing ecstatic galaxy is held together by the force of a deep void – a black hole. We circle around its outstretched legs as the very gravity of this object pulls us ever closer through its revolving arms. It is so powerful that entire solar systems are stretched into its gaping mouth and consumed at the speed of light. These systems repeat each other on every size and level. It applies to a scale so large that we cannot even conceive of its meas- urements. It applies to the spider as well as the atoms that make up our human bodies. As the soft fabric grazes the side of my face – hanging lightly in the air, rippling in the wind, catching the sunlight in its fine threads – it touches the static objects with a delicate touch of its fingertips. Where is she? The owner of this web? As you see the fallen gazes, the bodies melting into themselves. Nearly like us, but not quite. It strikes that they are the prey, and you are the spider. Devouring them with eyes like sword. Cocooning, running through the white threads, becoming one. Eatself. In one of the images I have been sent I can see the bust of a woman. Her face seems to be turned towards a piece of cloth, a towel of stiffened chamois leather, or a soft canvas, that hangs on the wall. It remains almost invisible to me, but her hair, assembled into a small heap, suggests that she is not a loose woman. She knows what she wants without being selfish, without projecting only her own image onto the screen in front of her. She wants to look at something intently. She wants to take it seriously. Or she wants the screen to make her dream, but not frivolously. She wants to look out the window. It is only a white bust, a neck and a head emerging out of a malleable mass of wax, perhaps even carved out of marble, with a strange protuberance on the upper part of the figure’s back that the artist has not removed and that resembles the stump of an oddly placed wing, like the central engine on an MD11. The other object is only a white surface, perhaps the remainder of a faded photograph, or a sculpture of a photograph. What if she were sitting in a plane, as I am right now, flying over the sunny landscape of the South of France in early autumn? She remembers a day she spent in Aix a few years ago and looks forward to a short trip to the surroundings of Arles in two weeks time. I hope she will forgive me for indulging a pun. Now that I have begun to study her, the name Aix suggests to me the French word for peace, paix. May I call her Arlette? On the one hand, she invites me to imagine a scene, though she would recoil almost imperceptibly if I were so tactless as to make a scene and thereby fill the space and the time that stretch between us. This is not the bust of a woman who makes, or before whom one makes, a scene. 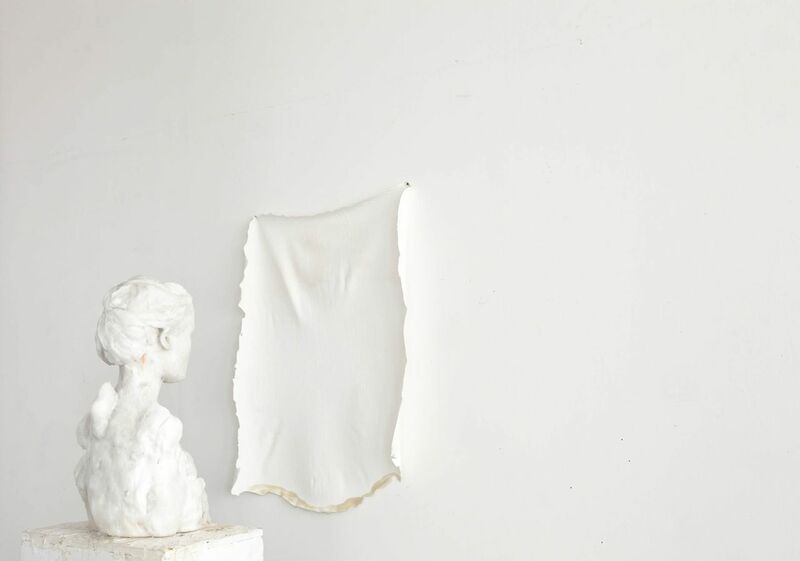 Yet an installation – and here two artists working together, a sculptor and a photographer, have installed a female bust opposite a sheet that has been loosely attached to a partition in a gallery – is always the imagination of a scene, and that’s why I tend to find installations so tiresome. Installations turn correspondences into a heavy and bulky matter because they make them their main business. They are too embedded in the politics of meaning. On the other hand, she is so quiet, so present and so withdrawn, that she effortlessly undoes anything that would remind me of an instal- lation, of the willful and theatrical arrangement of elements charged with meaning and meant to create even more meaning. On the one hand, on the other hand – a bust has no hands, so she does not know what I am talking about, and why should she care in the first place? I cannot tire her out, no matter what I do or say. The lecher is a stalker, the lover belongs to the people who say good-bye. Why, I have fallen in love with her! Virgile Ittah (b. Paris, 1981) is a recent graduate from the Royal College of Art who works with installation through sculpture and photography. Through her practice, she explores the notion of isolation, nostalgia and the impossibil- ity of return. Virgile exhibited in collaboration with Kai Yoda at Newark Park and The Wilson in the open west 2013. Selected shows include Saatchi New Sensations, New Order II at Saatchi Gallery, Young Gods at Charlie Smith Gallery and Griffin Gallery, London. Her work has been selected for the Catlin Guide 2014 and 100 London Artists book curated by Charlie Smith Gallery. She has exhibited in England and in France where she was awarded the Camera Clara Prize. Virgile Ittah was selected for the Catlin Prize exhibition in 2014 for which she created a new work. Kai Yoda (b. Tokyo, 1982) is a graduate from The Royal College of Art who works with installation through ephemeral situations with a strong interest in the interaction of the viewer being the center part of the work. Through various levels of clarity, he explores borders and distance within human interaction. Kai exhibited in collaboration with Virgile Ittah at Newark Park and The Wilson in the open west 2013. Selected shows include shows at the OBS Gallery, Royal Festival Hall, Barge House, Wellcome Collection Windows, and the Lighthouse. He was the recipient of Japanese Government Oversea Study Program for Young Artists in 2011, and was shortlisted for Open Call, Beers Lambert Contemporary 2014.